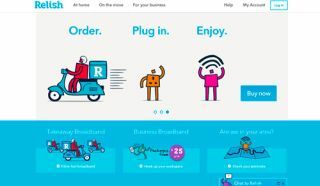 Relish wireless broadband service launches in London | What Hi-Fi? UK Broadband has introduced what it's calling a "transformational broadband offering" with the launch of a new service that promises to deliver "fibre-fast speeds without the wires". Relish is the name of this new service that will surely appeal to anyone who may be looking for a speedy internet connection but doesn't want any cables trailing around the house. According to UK Broadband, you won't even need an engineer to visit your home to set up your broadband because Relish can be "self set-up in minutes" – handy if you can't wait in. There are four "core" products that comprise the Relish package – Home Broadband, Business Broadband, Mobile Broadband (Pocket Hub) and Dedicated Business Internet. If you opt for Home, Business or Mobile services and live/work in central London, you'll get next business day delivery and installation of your Relish Hub from the time of your order. Relish promises "transparent pricing, no hidden charges and no landline tax" from the service – it's available from £20 per month and doesn't require a fixed telephone line to connect. The launch comes as UK Broadband published the results of a report carried out by the Centre for Economics and Business Research (CEBR) into the costs of traditional broadband services. According to the research, one million London households and 240,000 SMEs currently spend in excess of £193m on what UK Broadband has described as a "landline tax". It refers to the landlines that customers are required to have installed in order to access internet infrastructure, while landline charges have increased 68 per cent over the last decade. CEBR senior economist Colm Sheehy said: "The fact that a landline is required for most broadband services despite falling call volumes indicates that many consumers are getting poor value for money from their monthly landline rental."